The historic Silifke Castle in the Silifke district of Mersin province has been undergoing extensive restoration meant to promote tourism in the region once complete. This province has hosted settlements starting from the Roman period. In later years the castle was one of the most important landmarks of the Ottoman Empire after the conquest of Cyprus. Other than the extensive restorations being carried out at the castle, it has also been the site of an archaeological excavation since 2011, which has unearthed traces of the Roman, Byzantine, Karamanid and Ottoman periods. The excavation work at the historical castle is being led by professor Ali Boran of Selçuk University (SU) Faculty of Letters, and his team of 15 people. In previous works, the exterior texture of the castle's façade was revealed, this year excavations were carried out in sections called "hisarpeçe" between the ditches and the city walls. The findings discovered during the excavations inside the castle have been delivered to the Museum Directorate for registration and are to be put on display after being cleaned. In addition to the archaeological excavations, the restoration of Silifke Castle ensures that the castle will still be standing for future generations to see. 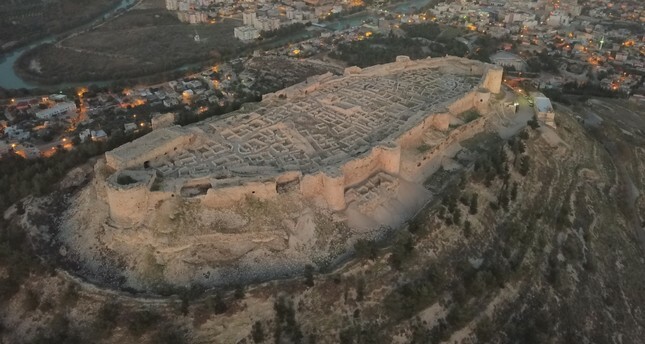 The restoration is being carried out by the Culture and Tourism Ministry and the Mersin Governorship with priority being given to the walls of the fortress. Boran spoke to Anadolu Agency (AA) and said that both the excavations and restoration are taking place simultaneously. Boran noted that during the excavation, some of the best examples of architecture of the Ottoman times in Anatolia have been revealed, while a mosque, commercial buildings and houses have been unearthed as well. The fact that the restoration and excavation are being carried out at the same time is very important according to Boran. "Silifke Castle is undergoing a grand change. It will serve the history, culture and tourism of the region within a few years. Watching the sunrise, sunset and the full moon from Silifke Castle is a pleasure. We are expecting it to draw many visitors," he added. Boran further noted that the Culture and Tourism Ministry, the province's governorship, Silifke District Governorship and Mersin Metropolitan Municipality all feel the project is of great importance and added: "When AK Party [Justice and Development Party] Mersin member of Parliament Lütfi Elvan was the Minister of Development, he contributed a great deal to the work here. Governor Ali İhsan Su and Silifke District Governor Şevket Cinbir also closely follow the work." Dr. Razan Aykaç from Selçuk University's Art History Department, who is responsible for the laboratory work of the findings collected at the castle, noted that ceramic, metal, stone, wood and glass items have been unearthed at the site. These items are cleaned at the laboratory and then Aykaç said they are measured after the cleaning, drawn and classified. "These artifacts belonging to the Roman, Byzantine, Karamanid and Ottoman periods play an important role in shining a light on the history of both the region and the castle. These items provide crucial information about the history of Anatolia," said Aykaç.